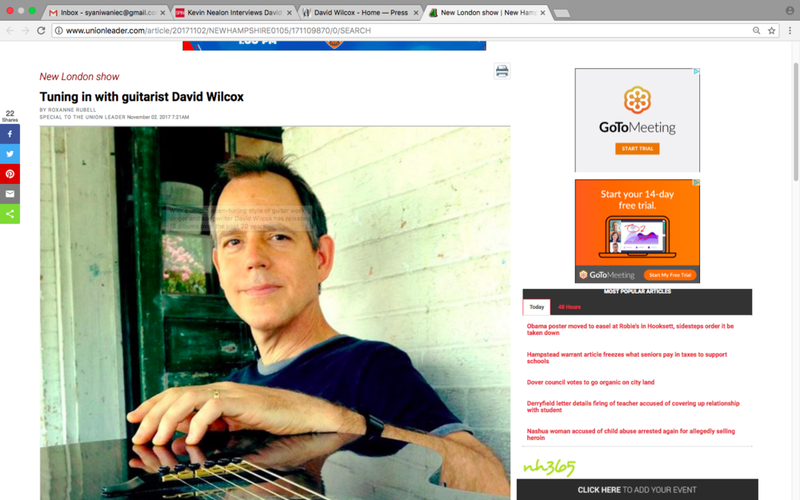 For more press clippings and information, please visit Music + Art Management, Inc.
David Wilcox ready to celebrate Thanksgiving with friends via The 828. Tuning in with guitarist David Wilcox via The Union Leader. "2018 - SPIN Magazine reprints Kevin Nealon's interview with David from 1993." Wilcox brings his Americana musings to Music on Market via The Daily Record. The Whittier Shannon center, October 11th, 2014. What a wonderful night. I’d like to be real clear, and honest. It was a night of miracles. Like you sang, every things Holy. It was a holy night. I an going to send you the blog where my friend Diana was “hoping” to come to your concert, something she was leaning into living for. It wouldn’t have been so incredible if I hadn’t been in the hospital with her just 2 weeks ago when the gals from hospice came in to tell her to get her affairs in order.